Is Outsourcing Household Payroll Right for Me? 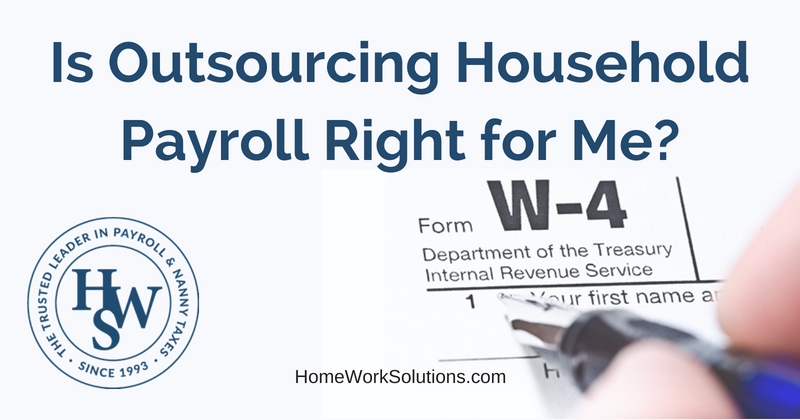 Home / Our Blog / Is Outsourcing Household Payroll Right for Me? You live a busy life and sometimes, you feel overwhelmed with the demands and tasks that continually pile up. If you’ve hired a household employee such as a nanny or senior caregiver and you simply don’t have the time to manage the payroll and make sure that all the taxes are being withheld properly, it may be time to consider a household payroll service. There are many benefits to outsourcing. Here are some of the main reasons to consider delegating payroll to the professionals. Do you want more time with your family? Or perhaps you simply don’t have time to sit down and process payroll and calculate tax withholdings every pay day. Maybe you have no desire to stay on top of changing tax rates or filling out tax forms four times a year? Outsourcing your household payroll and tax preparation will save you valuable time, and may even save you money in the long run. Not to mention, working with a professional nanny payroll service that has federal and state law plus household labor laws information available at their fingertips will save you significant hours when everything is all said and done. #2: You won’t be confused. It’s true: household payroll and tax preparation can be complicated and downright confusing. No matter how organized you are with your paperwork and your research process, managing this portion of your life can be hard. Minimize your own confusion and save yourself the headache of possible mistakes by outsourcing. You’ll breeze through each payroll week and tax season worry free. You won’t need to spend time reading up on the many changes to laws and you won’t need to worry about making the right deductions. Your household payroll specialist is skilled in each part of the process and will navigate everything for you, so payments are seamless. Not only does a domestic payroll service make your life less stressful, but it adds convenience too. It’s not only convenient for you because you don’t have to do it, but it’s convenient for your household employee because they can count on an automatic deposit every payday and there will be no confusion as to when it can be expected or need to run to the bank to make a deposit. Sometimes, the simplest thing you can do to organize your life is to outsource things as much as possible. Tackling payroll or other tax deductions for your household employee can be difficult, so don’t try to tackle it on your own. Doing it wrong could cost you money in fines or other fees for errors that you didn’t see. Avoid the hassle of this by outsourcing from the very get go, and plan on working one-on-one with a household payroll specialist. Contact our team today for more information on our household payroll tax compliance service!